Treacle-mustard is not easily confused with other wild plants on this web site. An erect, stiff annual plant, Treacle-mustard can grow to 70 cm, on waste, bare, cultivated and arable ground. Its square stems are covered in whitish hairs which are flattened. 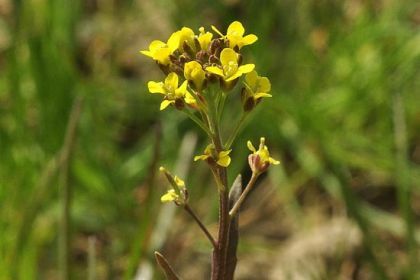 It bears its small, yellow, four-petalled flowers (6–10 mm) in racemes which stretch out as the plant matures and the seeds develop. The four petals are twice as long as the four sepals and the flower blooms from April to August. Shallowly-toothed, dark lanceolate leaves form a basal rosette which dies off before the flower blooms and there are upper narrow, alternate leaves which persist. The fruits are held in slender, slightly-curved pods. 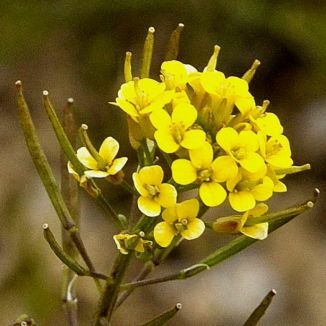 This is not a native plant, is thought to have been originally introduced with grain, and it is a member of the Brassicaceae family. My first record of this plant was from the grassy verge of a newly built roadway near Athy, County Kildare in 2010 when I also photographed it. I am grateful to Dr Declan Doogue, BSBI Vice-county Recorder for County Kildare for confirming my identification.